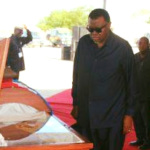 The President of Namibia, Dr. Hage Geingob, described the late Major General Peter Namundunga as a man fought with strength, honour, bravery and patriotism for the freedom of Namibia. 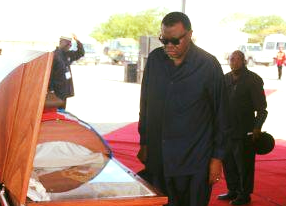 President Geingob paid his final respects to the late general at the Omugulugwombashe Monument in the Omusati Region during the burial service of the retired general who passed away on 14 January this year. Death has come like a thief in the night and from our midst has stolen another stalwart of our Liberation Struggle. And so, we gather at this historic and poignant site, to say our final goodbye to this heroic soul, who has departed our world and left a void in our hearts, which we can only attempt to fill, through the memories of his lifelong exploits. Author Chinua Achebe aptly captures the concept of destiny by saying, “Every generation must recognize and embrace the task it is peculiarly designed by history and by providence to perform.” The hallowed and historic grounds which we stand on represent a moment in our nation’s history when destiny called on the gallant sons and daughters of Namibia to recognize and embrace the task which was designed by history and providence, for them to perform. That task was to wage armed struggle for the complete liberation of the Namibian people. That historic task; that moment of destiny, commenced right here at Omugulugwombashe, marking one of the most pivotal moments in the history of our Republic. For this reason, it is fitting that a shrine, which represents the courage, valour and unwavering spirit of Namibian Freedom Fighters, should be the final resting place of one of the great heroes of Namibia’s struggle for independence, Comrade Major General Petrus Kagadhinwa Nambundunga. Here, where the first shots in our armed struggle were fired in anger, we bury a man with a selfless disposition; who was ready to sacrifice all and was ready to lay down his life for the purpose of liberating the people of Namibia. Although our hearts and souls are weighed down by a sense of profound loss and grief, we are not hopeless because death can never extinguish the flames of Comrade Nambundunga’s life of hard work and perseverance. As we prepare to hand over our son back in the hands of the Creator, we express, once more, our utmost gratitude. Comrade Nambundunga, you fought with strength, honour, bravery and patriotism. We bid you farewell as you join your brave brothers and sisters who lie here, in eternal peace. We are filled with pride and gratitude, because it is due to heroes like you, that we can raise our national flag in Namibia, the Land of the Brave, whose fight for freedom, you and your brave brothers and sisters have won. May your gentle words and brave deeds remain in our hearts forever, may your life serve as an inspiration for those of us who remain behind, may your accomplishments inspire us to continue to work diligently and selflessly in building a Namibia befitting of the memory of the sons and daughters whose blood waters our freedom. Comrade Nambundunga has left behind the light and momentary troubles of the living world and we believe that his good deeds and exemplary life have earned him an eternal glory that far outweighs his lifetime struggles. Now that his temporary stay on earth has come to an end, we wish his soul a peaceful journey home and ask God to grant him eternal rest and peace. Go well, brave and humble son of the Namibian soil. Long live the memory of Comrade Nambundunga, Long live the Veterans of our Liberation Struggle, Long Live the Republic of Namibia.